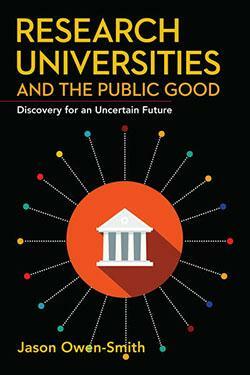 Jason Owen-Smith discusses his book, Research Universities and the Public Good: Discovery for an Uncertain Future, with Inside Higher Ed. We may think the idea is so obvious that we don’t bother to make the case as clearly and rigorously as we should. I wrote this book to show how research universities look to someone like me…The last decade was not good for higher education. A recent Pew survey found that 58 percent of Republican-identified respondents believe colleges and universities have a negative effect on the direction of the country. States continued, and often accelerated, divestment from public universities…Our dominant language for talking about the value of universities and their work is ill suited to seeing and sustaining their most important purposes. Being sanguine about our contributions to the public good is a loser’s game, especially now.